Are you looking for a fast and affordable way to improve the interior atmosphere of your home? With our floor tile installation in Stroudsburg, PA, you can add a new, durable surface that perfectly matches your sense of style. From sleek and modern to rich and classic, we offer a wide selection of tile flooring that ensures your every need is satisfied. Check out designs from high-quality brands like Floorcraft and Design Distinctions, and choose from options that include slate, porcelain, and ceramic tile. When investing in something like flooring, you want to make sure that you are completely confident in your decision. We understand that no one wants to feel rushed or limited in such a lasting choice. With an extensive network of affiliated flooring stores and impressive buying power, we can offer some of the lowest prices on the most stunning tile floors. One of our highly trained associates is here to inform you about our many options and low prices on flooring solutions for any room in your home or office. Besides its traditional beauty, tile flooring has many benefits. It can last for years, is easy to maintain, and is one of the best types of floors for handling water, which is why it’s a popular choice for bathrooms and kitchens. 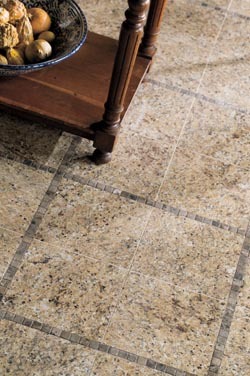 Tile resists frost, fire, moisture, stains, scratches, and slips and is easy to clean. All you need is a mop and a broom, and you’re set. The different types and varieties make it easy to find one that’s a good fit for your home and budget. Tile is especially wonderful for pets because the hard surface can stand up to sharp toenails and accidents can be cleaned up easily. Tile is also good for the earth because it’s environmentally friendly. Tile factories reuse and recycle materials and the floors themselves release no volatile organic compounds. Our floors can resist nature too, as tile is naturally inhospitable to germs, bacteria, dust mites, and mold. There are few flooring options that offer so many features and benefits as tile flooring. That is why so many people turn to this type of flooring when they are looking to make upgrades on their properties. Ceramic Tile is a classic favorite that has been in use for hundreds of years, yet it’s still versatile enough to go in any room. It can even be mixed with wood and carpet to complement your interior design. Our ceramic tiles consist of long-lasting material and creative designs, so you get the best of both worlds in terms of appearance and function, and at a great price. Interested in a ceramic tile installation? Then speak to one of our knowledgeable tile flooring specialists to learn more about how we can help install your brand-new ceramic tile at a very affordable price. The installation team at our company has a deep understanding of all the products we sell, which means we know how to install everything with the proficiency necessary to deliver the results you want from your new floors. Our porcelain tile can be customized with endless accents and trim pieces that can be used in formal and informal settings. It can even be made to resemble travertine, marble, and natural stone. Porcelain also holds up well in high traffic and resists bacteria and allergens. Another great choice is our natural slate tile that comes in gorgeous earth tones. It is one of the strongest and most long-term flooring materials in the market. Slate is especially good for kitchens, bathrooms, and pool areas because it’s completely waterproof. Want to know how to tile a shower? The answer is going to be with the exceptional porcelain and slate flooring options from our store. Our team is ready, willing, and able to not only help you find the perfect flooring options for your specific needs, but also provide complete floor tile installations as well. You are going to be happy you chose us when it comes time to upgrade the look and feel of your bathroom, kitchen, or any other room in your home. Our commitment to helping you doesn't end after you've made your selection. We offer professional floor tile installations as a part of our comprehensive flooring services. With our help, you won't have to worry at all about bringing your flooring project to life; we've got you covered from beginning to end. Furthermore, we offer the most competitive installation rates in the area and an experienced team that takes time to listen to customers and caters to their needs. This helps you ensure that you not only receive the impressive workmanship you expected from a professional team like ours, but also that your design ideas are able to come to stunning life efficiently and effectively. In addition to a quality install, our crew is also skilled at being creative. No one is ever limited to the basic grid of square tiles. Our brick floor and checkerboard patterns are extremely popular, and for good reason. These beautiful designs can add retro or subway style look to your home and make it like no other. You also have the option of creating a tile border. The process is simple but will add an elegant touch to the final product that puts a mark of your distinct style in your home. Stop by today and let your imagination run wild! Contact us for tile that will make you smile. Ask about our up to 60 months of flexible financing. We’re proud to serve customers in Stroudsburg, The Poconos, Slate Belt, Northampton County, and Nazareth, Pennsylvania, and the surrounding communities.